It’s been a few years since I shared the news that there is a blood test for fibromyalgia. I was doubtful then if there was a point in having the test, and my thoughts really haven’t changed much. At the moment having a positive result on a fibromyalgia blood test won’t change your treatment, so what’s the point? Except maybe there might be a point soon. I posted a few months ago about how EpicGenetics, the creator of the fibromyalgia blood test, are now working on a vaccine for fibromyalgia. It was with that in mind that I agreed to take the test. It also helped that they comped me the test in exchange for the knowledge that I’d write about. Quick note: The FM/a fibromyalgia blood test is covered by some insurances… mine was not one of them. The out of pocket cost for this test is expensive by most any standards ($936). Getting the fibromyalgia blood test done was actually pretty easy. The hardest part was cutting my Tumeric supplement for 30 days prior. If you take any anti-inflammatory medications or supplements you have to stop them for 30 days before the test or it can screw up the results. Because I don’t have a doctor here that would order the test, Dr. Gillis (of EpicGenetics) ordered it for me. The test kit was delivered to my home and then I had to find a lab that would draw the blood for me. This took a couple of calls but I did find that Quest Diagnostics will do this for less than $25. Once the blood was drawn I placed everything back in the provided box with the provided return shipping label and dropped it off at FedEx. EpicGenetics asks that you get the labs drawn as late as possible to drop off for the last FedEx pick-up time available. The box is then overnighted. This ensures that the samples are as fresh as possible when they arrive for testing. A few weeks later I received a letter in the mail with my results. From a glance you can tell that my results fall into the “extremely confirmable” range. But, what does that mean? What do the results of the Fm/A fibromyalgia blood test mean? 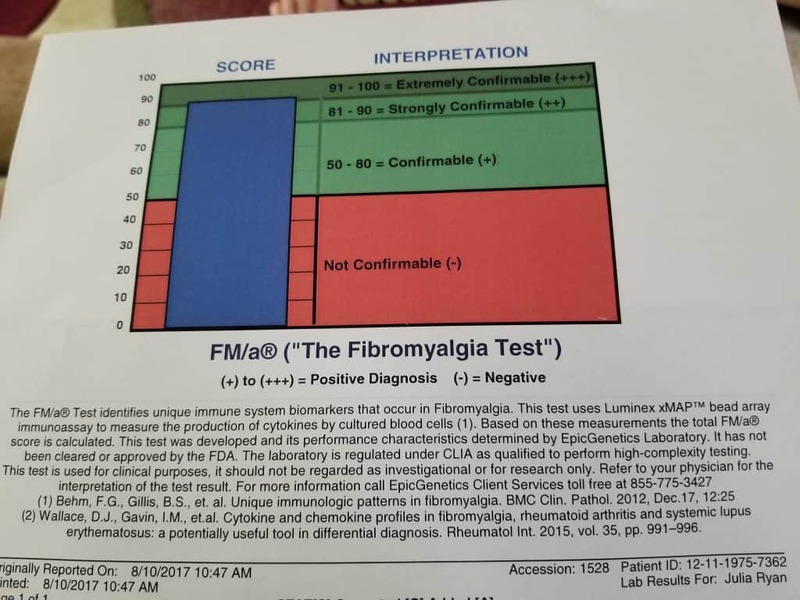 I was able to get on the phone with Dr. Gillis and ask a few questions to help me better understand my results and the fibromyalgia blood test. What is the FM/a test testing for? First off, to understand how I tested to positively we’ve got to understand what this test is looking at. What Dr. Gillis found through several studies is that people with Fibromyalgia typically have very low amounts of specific proteins (also known as cytokines and chemokines) in their blood. It seems that for some reason we may have an inability to produce these proteins properly. The test is measuring these four cytokines and chemokines. I tested abnormally low. The lower the amounts of these proteins in your body, the higher the likelihood that you have Fibromyalgia. Thus my greater than 90% likelihood of having Fibromyalgia. Does the Fm/A test rule out other illnesses? One of the big debates in this whole testing issue is that those proteins may also be low in other illnesses. The initial studies that Dr. Gillis and others have performed have compared the levels of these proteins in patients with Fibromyalgia against RA and Lupus and have been able to successfully differentiate. However, that still leaves CFS and Lyme which are big question marks. I know my friend Donna at FedUpWithFatigue.com who has recently been diagnosed with Lyme is planning to have the FM/a fibromyalgia blood test and we are curious to see what her results show. That said, Dr. Gillis provided me with the list of the specific cytokines (MIP-1Alpha, MIP-1Beta, IL6, & IL8)and chemokines that are tested for and that are LOW in patients with Fibromyalgia. This study (and possibly others) shows that at least two of these (MIP-1Alpha, MIP-1Beta) are typically increased in patients with Lyme. Another study showed the same with IL6 and IL8. I did a search on Google scholar and didn’t find anything coming up on these proteins with CFS (so that may still be a question mark). Ok, so now that we have that out of the way…. let’s look at my test results again. How accurate is the fibromyalgia blood test? I asked Dr. Gillis about this and he said that the test is 93% accurate. That means that it can accurately diagnose fibromylgia 93% of the time. That’s a pretty high %, but it does mean there is some room for error (there always is). What about the Fibromyalgia vaccine? The vaccine that EpicGenetics is looking at already exists. It’s the BCG vaccine that is used for Tuburculosis, but it is not given at the same rate. This answers the question of why someone who has had that vaccine could later still get fibromyalgia. Also, it’s less of a vaccine to prevent fibromyalgia than it is using an existing vaccine to treat fibromyalgia. Dr. Gillis also pointed out that the species of BCG that they are studying is not the same species that is currently being used and it hasn’t been used in decades. BCG has been used to raise these same proteins in cancer patients (for whom the proteins are often destroyed during chemo). Because BCG has been found in those situations to raise the levels of these specific proteins Dr. Gillis and his team believe it will also work to raise the levels in Fibromyalgia patients and in doing so reverse their symptoms. 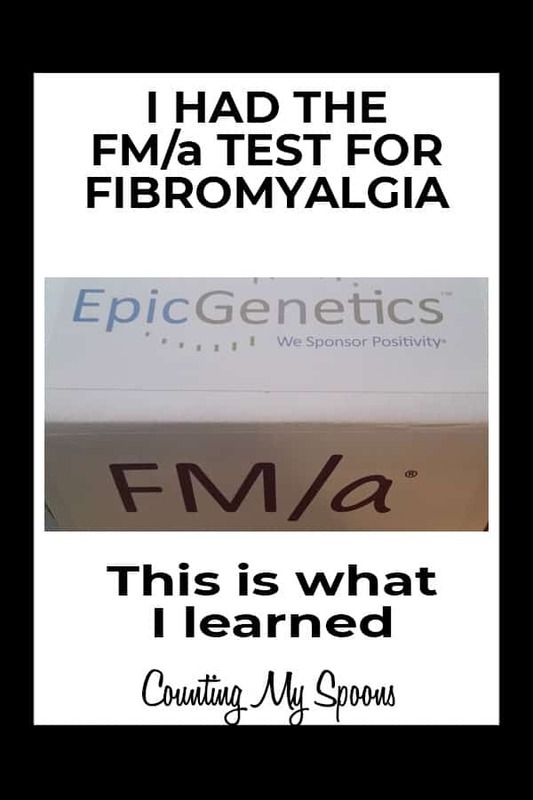 They will soon begin a medical trial to test this theory and they will use patients who have tested positive with this blood test for Fibromyalgia via the FM/a test as the participants in the study. This is why I finally considered having the FM/a test in the first place. While my Fibromyalgia symptoms are largely under control there is always room for improvement. Until I’ve improved to the point that I don’t feel at all limited in what I can do I will consider all options and continue to look for new treatments and that may well include this vaccine. Fibromyalgia blood test, is it real? Behm, F. G., Gavin, I. M., Karpenko, O., Lindgren, V., Gaitonde, S., Gashkoff, P. A., & Gillis, B. S. (2012). Unique immunologic patterns in fibromyalgia. BMC clinical pathology, 12(1), 25. Grygorczuk, S., Pancewicz, S., Zajkowska, J., Kondrusik, M., Świerzbińska, R., & Hermanowska-Szpakowicz, T. (2004). Concentrations of Macrophage Inflammatory Proteins MIP-1a and MIP-1ß and Interleukin 8 (Il-8) in Lyme Borreliosis. Infection, 32(6), 350-355. Pietruczuk, A., Świerzbińska, R., Pancewicz, S., Pietruczuk, M., & Hermanowska-Szpakowicz, T. (2006). Serum levels of Interleukin-18 (IL-18), Interleukin-1β (IL-1β), its soluble receptor sIL-1RII and C-reactive protein (CRP) in patients with lyme arthritis. Infection, 34(3), 158-162. Interesting and frustrating also . A trial using the typhoid vaccination has been taking place in Brighton in the Uk . I had a vaccination and mri at guys in London in 2014 . Never told me what the vaccination was but did get rid of a rash I’d had for months . A virus attacking the nervous system feels to me to be playing a part . I’ve just had my results and I tested for 91%. I live in Scotland in the UK and had to fund the test myself. I’m glad I did it. The science makes sense to me. I have had a few instances where my fibro pain disappeared. Instantly disappeared. it was like a tiny electric shock. As if a light switch had just gone out. That kind of instant. It happened once for 20 minutes when I had the flu. It came over me in a wave and all the stiffness disappeared. It was really amazing. But then the pains came back just as suddenly 20 minutes later. Another time was when I had a urine infection. Although I was in pain from the urine infection, the usual fibromyalgia pain was greatly reduced. But it came back in a few days. Having read what they’re testing for I’m on board with. It explains what happened to me. I would like to take part in the trial and I believe it will work in that the chemokines and cytokines will get increased and the pain will disappear (just like what must’ve happened when I had the flu and that urine infection). However I think that maybe once our bodies have fought off the TB bacteria in the vaccine, then the cytokines and chemokines will go back to their usual low levels and with that the pain will return. No one has really answered the question as to WHY these specific chemokines and cytokines are low in the first place and what’s keeping them at those low levels and I’d like to know if their being low is why we struggle to get into deep sleep and if our ability to sleep better will be improved with these cytokines and chemokine levels going up. The problem with this test is SO many doctors won’t put credence into it. FIRST appointment with this guy, and he’s making HUGE assumptions! He didn’t know me, asked me a HANDFUL of questions…and THAT was his finale!!! DON’T!! I’m SO VERY SERIOUS. Look, if you think for ONE second that BIG PHARMA cares about fibromyalgia and proving its existence, or FINDING A CURE???!!! I’m sorry, but up until now, they’ve given us what-ONE crappy med??? No. Also, has anyone been watching what is going on with vaccines? Did you hear about the politician who DIED the DAY AFTER he spoke out in favour of them??? No punchline. It wasn’t a joke. PLEASE pay SPECIAL attention to the meds and supplements you are taking!!! Do your research!! SO MANY medications-MANY of which are prescribed for us Spoonies, have LIFE THREATENING side effects, black box warnings, OR, they soon will!!! Please, Spoonies-KEEP your life…as miserable as it CAN seem. Remember the old adage about “things being WORSE”. I promise you, they CAN!!! 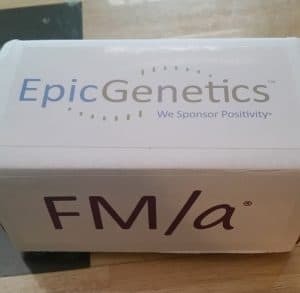 For anyone who is reading this and concerned about the cost of the test,,,When EpicGenetics originally checked my insurance benefits, the cost to me was going to be around $700. Several months later, I called back and asked that they recheck benefits because I had met more of my deductible. The rep asked if I was going to use my own physician or one of theirs. I told her I could use one of theirs if it would be less complicated. I was very surprised by her answer. If I chose to use their physician to order the test, there would be $0 cost to me. If I used my own physician, there would be a cost to me (can’t remember the amount, but my insurance only covers 50% of the cost). Of course I chose their physician! Evidently they have a contract with Blue Shield of CA (which I am NOT insured by). I am currently in search of a new rheumatologist, as mine retired. It will be interesting to see how rheumatologists view the validity of this test. If your friend with Lyme’s had the test, I would love to know how that turned out. I don’t believe she has has she’s had other health concerns take priority. You can follow Donna at FedUpWithFatigue.com – I’m sure when/if she does finally get the test she’ll share it. I’m so glad this information was shared (your blog) on Pinterest, I’m exhausted, disheartened and every other adjective that describes what living with Fibromyalgia is like. I’m going to check with my insurance to see if the text is covered. Thanks for this information. I’m glad you found it (my blog and the info). At the moment a positive blood test doesn’t really change anything, but I remain hopeful that the vaccine trials will work out and show positive outcomes. I just got my test results back today. I hadnt been diagnosed with Fibro prior, and actually my mom pushed me to do the test as she had after years of suffering and being tested for everything under the sun with no answers… my road is being very similar. My results came back 93% for a positive result. Now Im trying to figure out what next. I struggle with this as I’ve not come across anyone yet who has tested negative and even talking to Gillis and asking outright I couldn’t get a straight answer outside of supplements getting in the way. The other side is that having a test doesn’t change the course of treatment, which is still simply focused on treating the symptoms. I’m curious to see what happens with the study that Gillis is doing using the EBV vaccine and how that plays out with people. I’d planned to take part but the info they sent me to sign up had a fee attached and I’ve never seen a medical study that charged the patients so that really bothered me. There is a charge to be a part of the trial? That is on top of the cost of the FM/a test and keep in mind 1/2 the participants will receive placebo. They did state that if the trial goes well they hope to give those who received the placebo the actual vaccine but I cannot believe they would charge to be a part of it! This all seems very fishy to me. I may have misunderstood. Talking to a few folks it seems that the charge was attached to having your genome mapped for a separate study, not for the vaccine trial. Unfortunately, I no longer have that paperwork to refer back to for clarification, but I’m hoping that is in fact the case. Everyone I’ve talked to that is planning to participate in the trial has said that they’ve been told that there is no fee attached and that Gillis is funding it himself. I had my blood drawn for FM/a test 2 days ago. I was diagnosed more than 20 years ago. In the past year my symptoms have been getting worse again. I want the vaccine. I will try anything. I can’t go on like this. For some reason my results did not show I have fibromyalgia. It turns out that use of over the counter nose spray could be the reason. I doubt this. I think it was human error. A phlebotomist was sent to my house to draw the blood. She recently returned to work after retirement. Recently as in her first day back and never administered the test before. It was also over 100 degrees that day. Is it possible the phlebotomist did not follow directions. Maybe a blood draw at 10 AM EST was too early, I have no idea when sample was dropped off at FedEx. As I stated, the temperature was over 100 degrees that day, could that have affected the results? My symptoms are “text book classic fibromyalgia”. This trial was the only hope I had left as I seem to be getting worse with age. I have been in a severe active flare for months now. I only hope I can be retested. Additionally the time stamp showing receipt of blood sample was more than 24 hours after the draw. Could this have impacted on my results? Meanwhile my psoriatic arthritis is flaring and prednisone is usually prescribed but steroids cannot be taken at least 60 days prior to fm/a blood test. I really can’t say, but it would be worth calling them and discussing it. I know Dr. Gillis has been very receptive to calls from patients with questions like this. From talking to him I know that there are medications that can cause issues with your results. Any anti-inflammatories can cause issues (and that may include your nose spray if it has anti-inflammatories in it). As much as I hated to, I had to stop taking Tumeric for a month prior because it is an anti-inflammatory and could have caused a false negative. They also do suggest that your sample be taken as late in the day as possible prior to the last Fedex pickup so that it’s not in transit any longer than necessary. However, I doubt that that would change your results so much as likely cause your sample to be unusable (but I really don’t know for sure). I just had my blood drawn for the FM’a test yesterday. I am now anxiously awaiting the results. I sure hope the FDA approves the BCG vaccine study shortly as I’m not getting any younger and I suffer from very severe fibro.